Recent Soulpepper Academy grad Katherine Gauthier is perfectly cast as Nora in this stylish, contemporary take on Ibsen’s story of a trapped, underestimated housewife. Pretty, poised and a little performative, Gauthier perfectly captures the meticulously put-together type of woman Nora is, especially in director Daniel Brooks’ insightfully modern vision. She’s at her best in act one when the sheen is still very much on Nora and her husband Torvald (Christopher Morris)’s seemingly perfect life, greeting Oyin Oladejo’ sympathetic Kristine Linde with a wonderfully stealthy blend of defensiveness, condescension and genuine care. Frank McGuinness’ translation is a bit clunky, a few story points don’t quite make the jump to a modern concept as well as they ought to, and at times the pacing drags but director Daniel Brooks’ work is generally refreshing and clever, carefully balancing style and simplicity. Each character is somehow both a realistic portrait and a caricature of themselves (Damien Atkins’ complex Nils Krogstad seems to expand and contract in accordance with how human he is in the eyes of his scene partner), Victoria Wallace’s beautiful costumes standing out brilliantly against Lorenzo Savoini’s bright white set. A Doll’s House shares an aesthetic with 2014’s sublime Tartuffe, a comparison that leaves the current production in the dust, but what it lacks in fully cohesive impact, A Doll’s House makes up for in singular, memorable moments. This is the proverbial Bedroom Farce of this season- a light, likeable romp placed among the more challenging, adventurous work to guarantee a few ticket sales and serve as something of an intellectual break for subscribers. 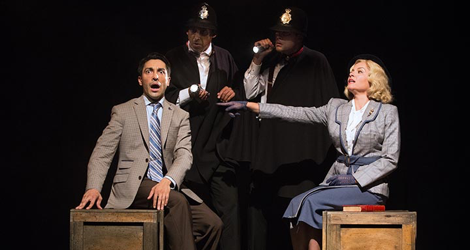 With The 39 Steps, Soulpepper has finally found the perfect recipe to fill this required season slot. The company is making visible and admirable steps towards fair representation and multiculturalism in their work and the dividends of that more inclusive philosophy pay off dramatically with diverse voices elevating what could easily have been a fairly dull farce. Director Ravi Jain infuses the production with a fresh perspective, his background in physical theatre and clown adding grand moments of hilarity and cinematic awe to unexpected places. Jain’s go-to leading man Kawa Ada delivers these moments with impeccable panache while the almost distancing extremity of his refinement finds the perfect outlet in a Cary Grant-like role that calls for not-a-hair-out-of-place debonair charm. Raquel Duffy, the lone Soulpepper mainstay in the cast, is sadly relegated to the few dull female roles while the men have (most of) the fun but what fun they do have with Hitchcock references galore and Anand Rajaram and Andrew Shaver playing dozens of different characters in a two-man vaudeville act that’s not to be missed. The Bedroom Farce show (as I’ve taken to calling it, though I’d also accept “the Norman Conquest show”, “the Idiots Delight show”, “the Play’s The Thing show”, etc) is never my favourite- it often feels dated and like something I’ve seen a hundred times starring and directed by the same old people who’ve done this a thousand times- but, in handing it over to Jain, Soulpepper’s found new life in an old farce, something I never thought I would see. Speaking of diversity, it’s thrilling to finally see a production with enough roles for black men that there’s room for both Dion Johnstone and Daren A Herbert, two brilliant MyTheatre Award winners whom everyone should cast more often. In Suzan Lori-Parks’ epic blending of greek mythology and civil war strife, Johnstone and Herbert play Hero and Homer, lookalike rival/friends whose diverging paths represent each other’s “what if”s. The woman at the centre of their tense, nuanced, often unspoken conflict is a steady but romantic Lisa Berry, standing tenuous ground between her head and her heart. 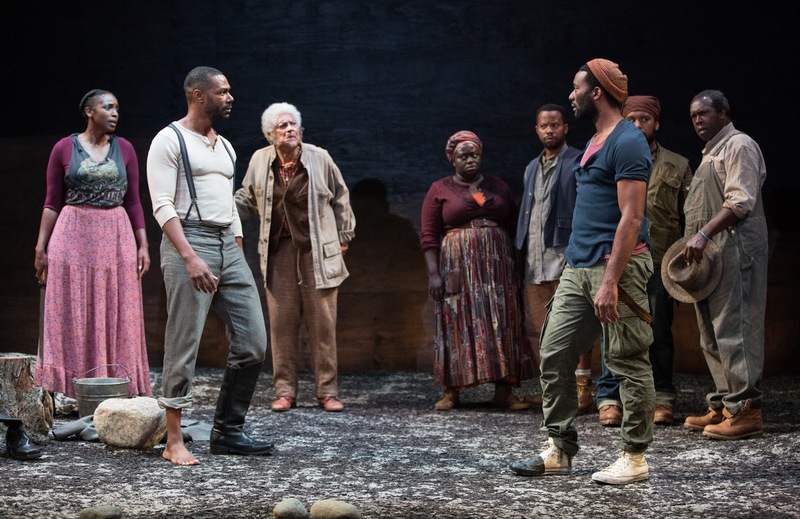 Part II of the play sends Johnstone’s Hero away from Herbert, Berry and the rest of the dynamic ensemble on the plantation, peering temporarily into his life during the war at the service of his master, a Colonel in the Rebel Army (played with brutal humour and sad fragility by Oliver Dennis). Delicious wordplay and standout monologues complete the piece with a beautiful, startling third act that is as quietly tragic as it is shockingly funny (Peter Fernandes as Hero’s loyal “Odyssey Dog” is truly a sight to see). Director Weyni Mengesha has been an MVP of Ontario theatre in the past few years and again brings her incomparable delicate touch to a standout production, trusting her actors, her designers and her text and delivering across the board.